So, a while back, I got this goofy idea to combine two of my favorite things: Shakespeare and Star Wars. I didn’t know if I could pull it off. 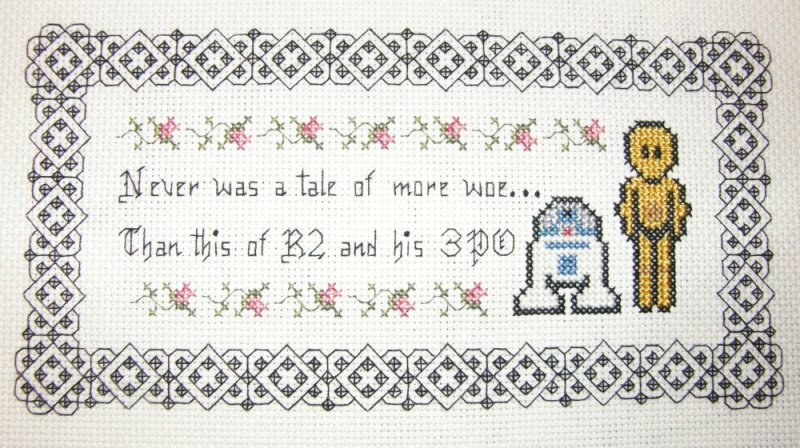 For one, I didn’t have a pattern for R2D2 and C3PO so I’d have to make them myself. My first few tries were disasters. R2 looked all right, but 3PO always came out looking rather squashed. Then I found patterns online for Gundam Wing character sprites. Inspiration hit and my first-try C3PO sprite looked pretty good. "Never was a tale of more woe... than this of R2 and his 3PO"
Now that I had my sprites and quote, how to put them together? I found a nifty medieval-style border in a blackwork book that I modified a bit and put that around the whole thing. But it was still missing something. What else could I add? ROSE BUDS. In hindsight, I probably should have used lightsabers, but I really dig the juxtaposition of droids and girly flowers. I have other “Shakespearean Star Wars” ideas I want to explore. But I think I shall find a simpler border to use next time, as this was such a pain in the rear to do.